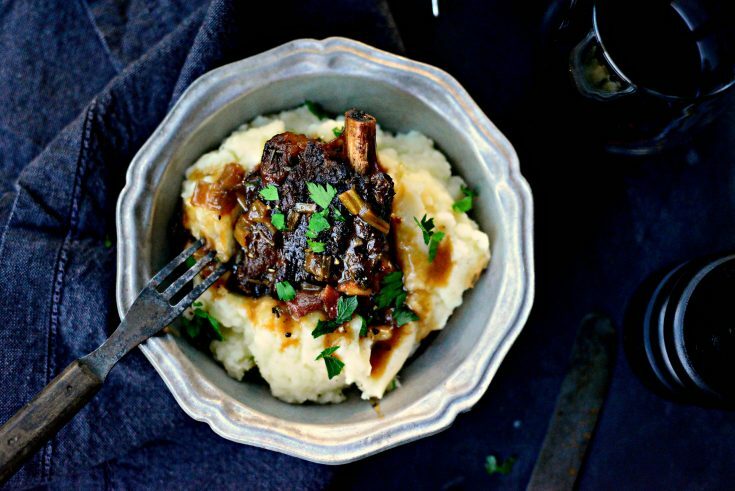 Braised beef short ribs is a classic comfort food. 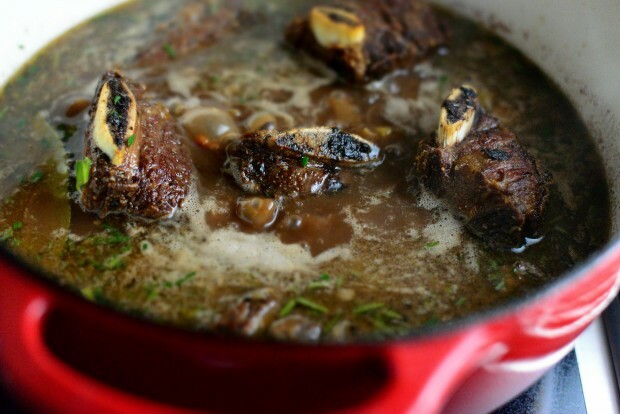 Short ribs are braised in herbs, broth and wine low and slow until falling-off-the-bone tender. 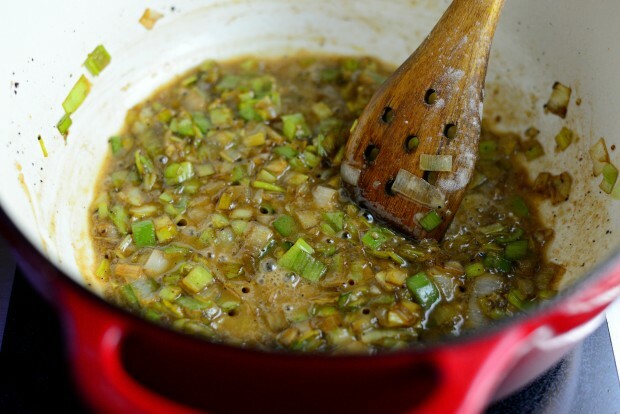 Beef slowly cooked in wine, broth with bacon and leeks. Uh-yes. I would happily choose a scrumptious meal consisting of tender hunks of slowly cooked meat that’s sitting on a bed of creamy mashed potatoes and then cover in deep brown gravy over any other meal. I’ve made this recipe a dozen of times and it’s very forgiving. 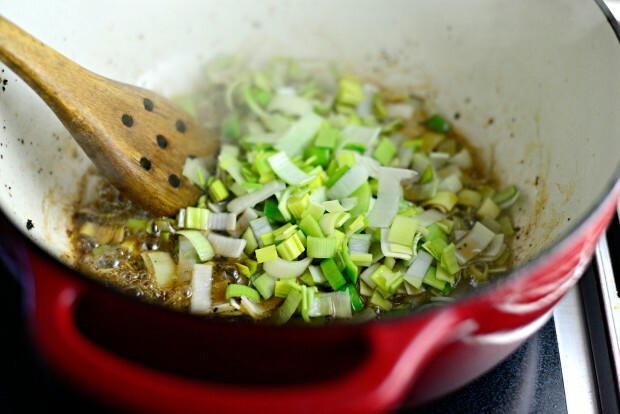 You can substitute yellow onions for the leeks, pancetta for bacon and you can skip the wine and use strictly beef broth and it’s still delicious, every single time. When I shot this recipe, it was the end of the day and I was chasing the light. My camera settings were all wonky. So hopefully you can look past all that and see the braised beef perfection because that’s exactly what it is. 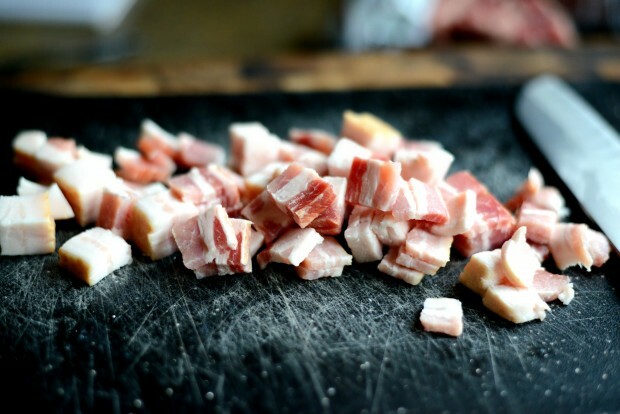 Start by dicing up 4 strips of thick-cut applewood bacon into small pieces. 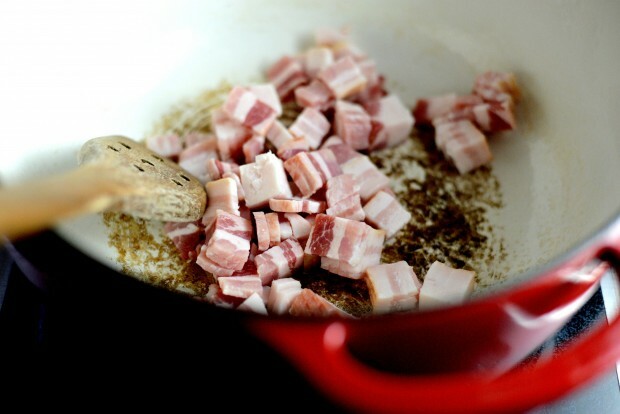 Transfer the crispy bacon pieces to a paper towel lined plate and set off to the side and increase the heat under the bacon fat to medium-high. Meanwhile, season all sides of the short ribs with salt and pepper. Sear the short ribs in the reserved bacon fat. I’ll let you in on a little secret, the secret to any good stew, roast or braised short rib is to sear it really well, you’re looking for dark brown brown and crispy-crusty sides. …until well browned on all sides. 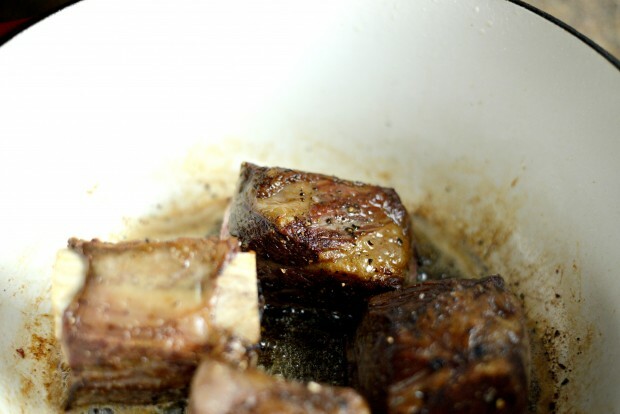 Transfer the browned short ribs to a plate and set off to the side. 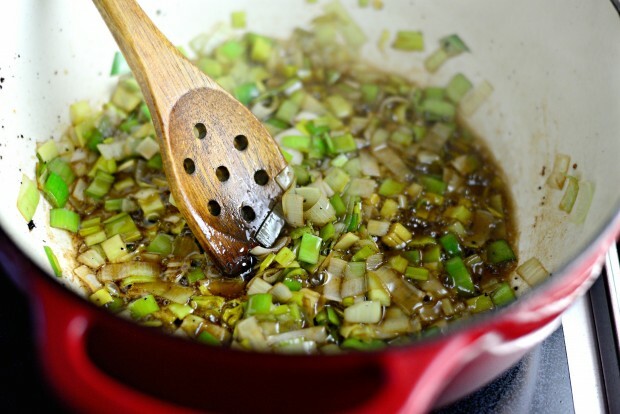 Add in the garlic and cook for 1 to 2 minutes. …stir and cook for 2 to 3 minutes. Then nestle those short ribs right on in. 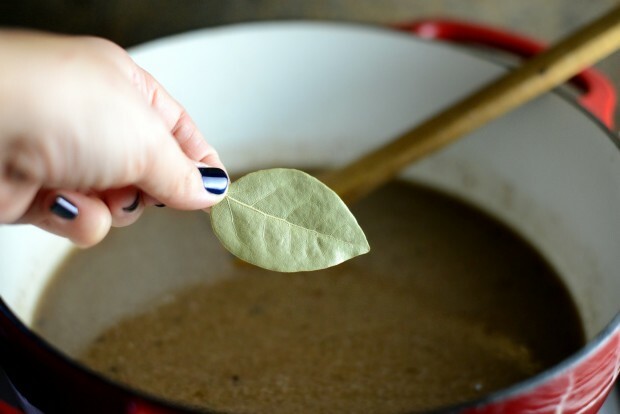 Cover, bring to a boil and slide into a preheated 350 degree oven for 2 hours. 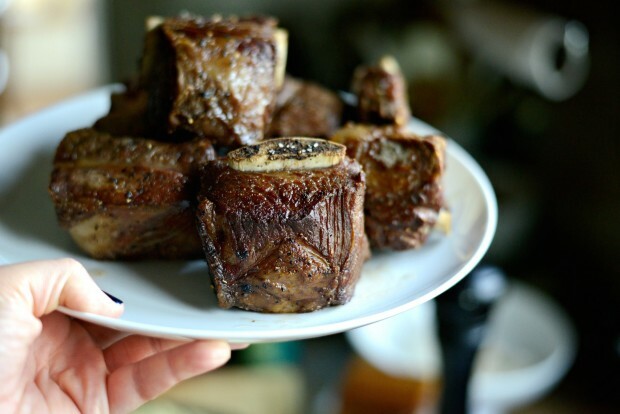 The short ribs should literally almost fall of the bone and be extremely fork tender. If they’re not those things then give them another 20 minutes in the oven before checking again. Repeat if necessary. 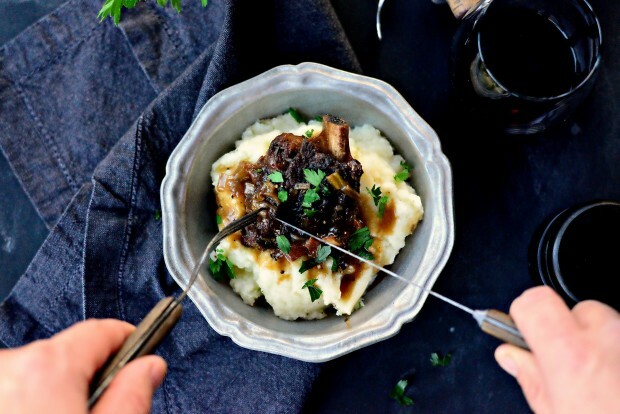 Serve short ribs on a pile of mashed potatoes and spoon the sauce over top. The short ribs will be fork tender, nearly falling off the bone and so extremely flavorful. The gravy is the ultimate. 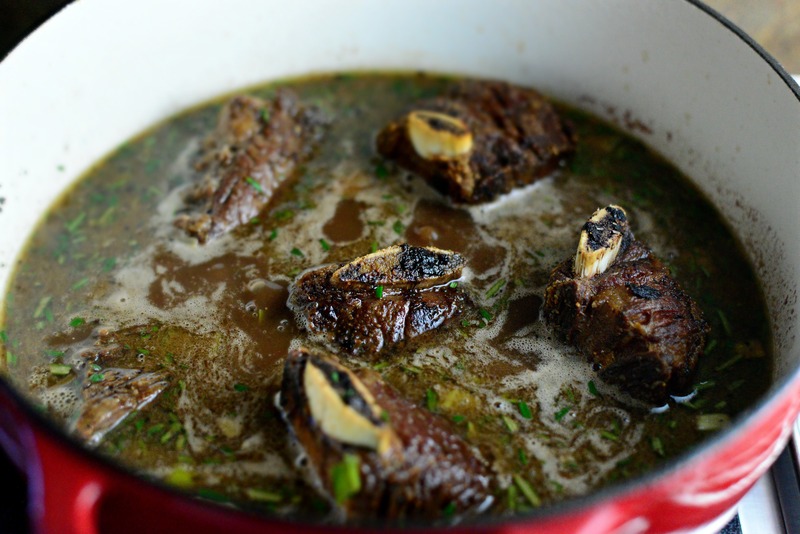 Depending on how fatty your short ribs are, you may need to pour the sauce into a fat separator before serving, discarding the fat and adding the liquids and any bacon and leeks back in to the pot, brought to a boil and reduce for a few minutes while the short ribs hang out on a platter and under some foil. 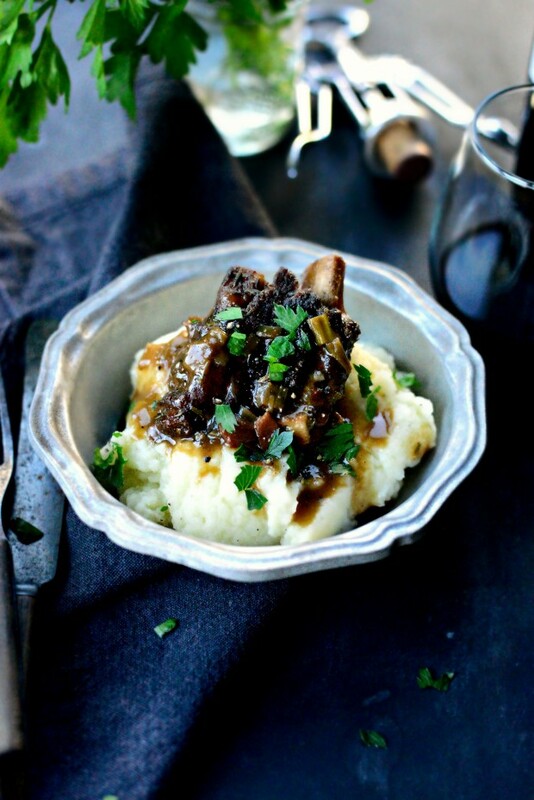 Beef shanks braised slowly in a wine broth with leeks and bacon. 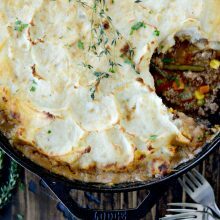 A super cozy comforting dish. 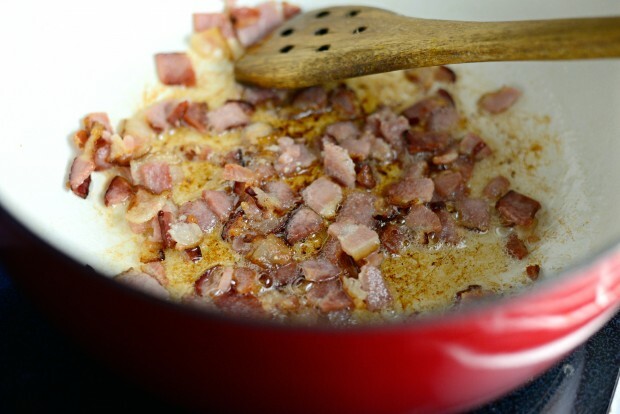 Place the bacon in a Dutch oven and heat on medium to medium-low. 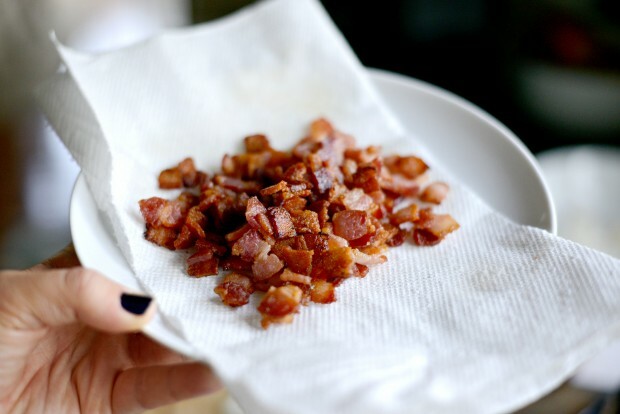 Cook until crispy, then transfer the bacon to a paper towel lined plate. Increase the heat to medium-high. 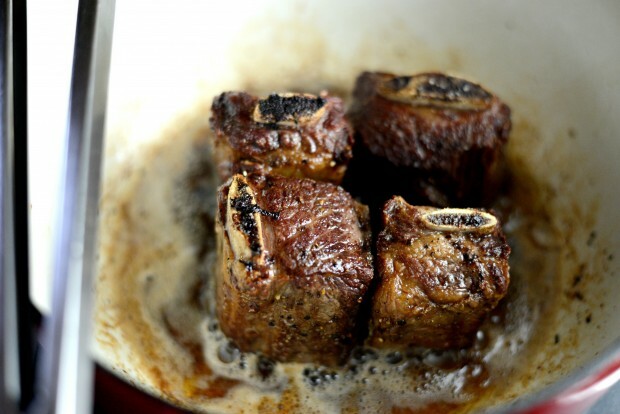 Once hot, sear the short ribs in the bacon fat for 2 to 3 minutes a side until all sides are browned. 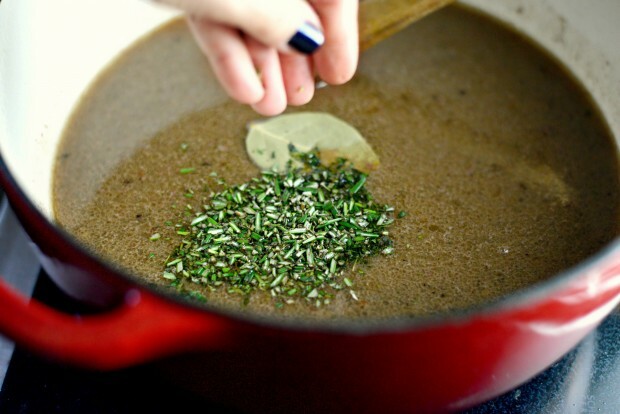 Drain off all but 2 tablespoons of fat. 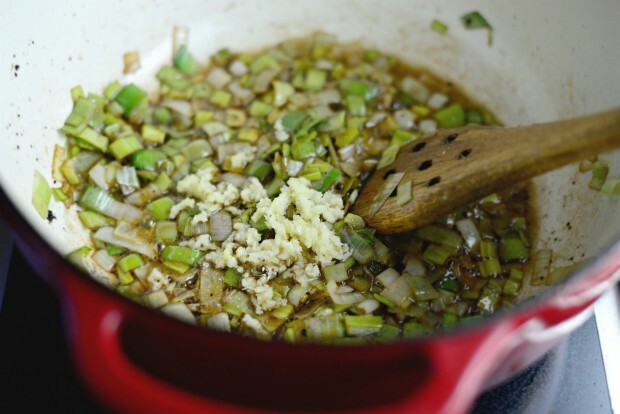 Reduce heat to medium-low and add in the leeks and cook for 2 to 4 minutes or until soft. Add in the garlic and cook for 1 minutes. 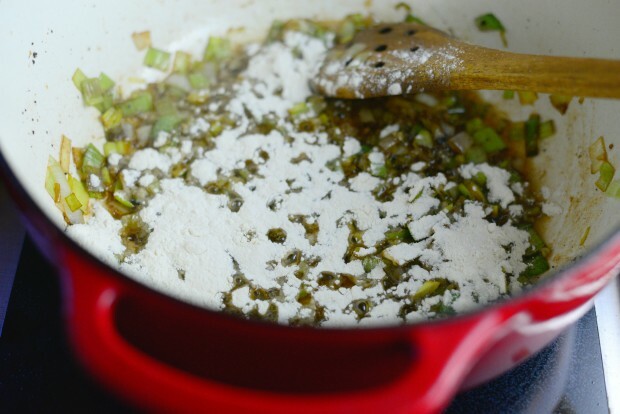 Stir in flour and cook for 2 to 3 minutes. 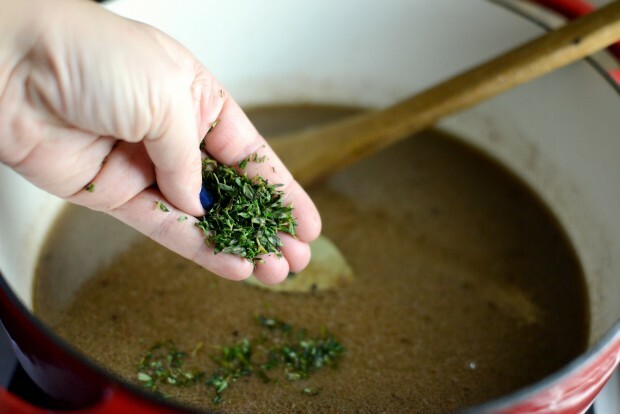 Pour in wine, broth and add in the bay leaf, thyme and rosemary and the bacon pieces. Add the browned short ribs back in, cover and bring to a boil before sliding the Dutch oven into the oven on the second to lowest rack. Cook undisturbed for 2 hours. 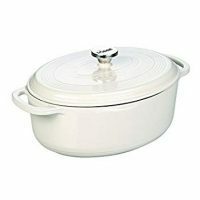 Depending on how much fat is in the pot after cooking, you may need to discard it. 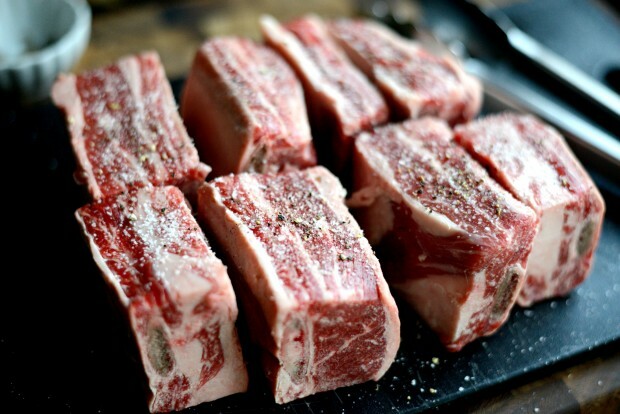 First, remove the braised short ribs to a platter and cover with foil. 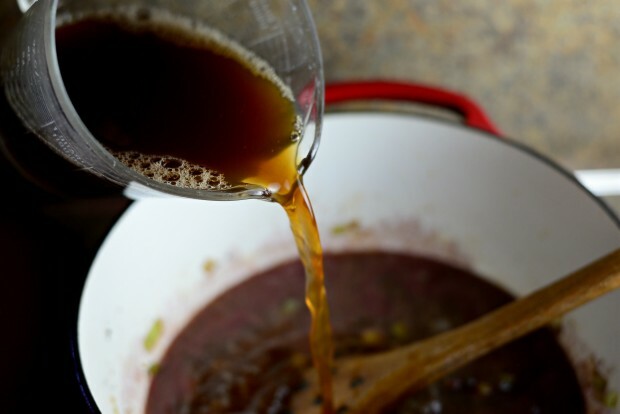 Pour the liquids from the pot through a fat separator, discarding the fat and pouring the reserved liquids and any solids (bacon, leeks and herbs) back into the pot. 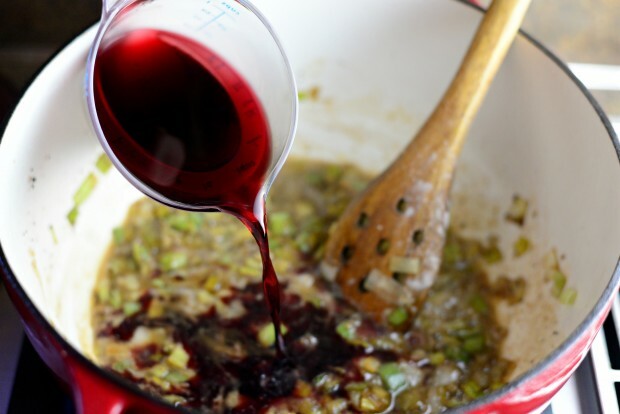 Bring to a quick simmer and reduce until thickened. 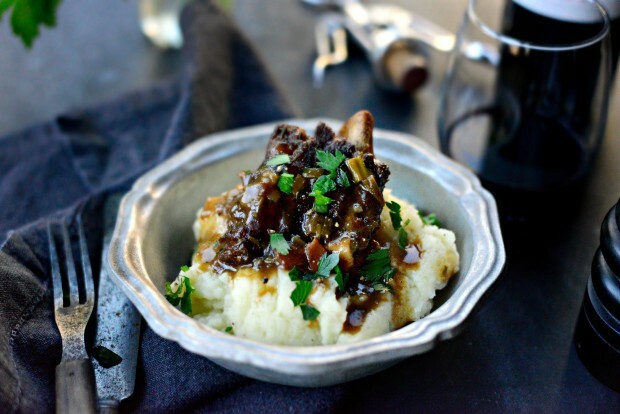 Serve braised short ribs on mashed potatoes with spoonfuls of the gravy over top. Note: The key to really good short ribs (roasts, stews etc...) is to brown the meat really well. Make sure you pot is hot and the sides of the meat get dark brown and crusty. I love the idea of short ribs, but it always seems to come out tasting more like pot roast (the kind we were brought up on). Are we doing something wrong? This looks amazing – but will it taste like pot roast? Funny you should ask this, Sally. 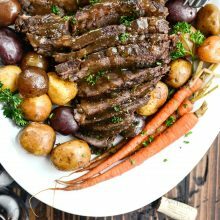 My husband isn’t the biggest pot roast fan (or any slow cooked meat, really) nor is he big on anything cooked with wine. Well, when I first made this short rib recipe for him he was pretty skeptical but ended up loving it. He said it had that faint roast taste but it wasn’t bad to him and he’s requested these a couple of times since. So to answer your question, I don’t think you’re doing anything wrong… but it’s hard to say without knowing the recipe and all that. I hope this helps! How much flour should be used? I didn’t see it listed in the ingredients but it’s listed in the instructions. Hi Candis! It’s two tablespoons- sorry about that! Thank you! Can’t wait to try it tonight for a Valentine’s Day dinner! Aww yea. This recipe was so good, a classic. I’m thinking this will be coming out of my kitchen many more times before any sign of warmer weather does. I especially like something that cooks a long time because when it’s ready, the kitchen is already cleaned up. On occasion. 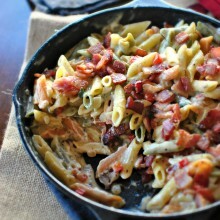 I made this last night (didn’t buy bacon, so made without) and it was still just SO SO delicious! Will certainly make again!